Time flies by! In May 2012, we joined numerous other partners to launch a new website and a new name for the region’s trail network: the Circuit. Two years later, we are pleased to produce a 2014 progress report (8 Facts to Know About the Circuit) on how the region is building out this remarkable trail network. 275 miles of the Circuit are complete; with 445 miles remain to be built. 30 miles were built since January 2012. Exciting new trail segments that are slated to be completed within the next three years include: The Schuylkill Banks Boardwalk, the Manayunk Bridge and the Ben Franklin Bridge ramp. There are 75 trail segments that have been studied, but need design and construction funding. The Circuit needs more investment. Currently, our 9 county area has only invested 1% of its collective federal transportation dollars for the Circuit. If the region builds 18 miles of trail a year, it can finish the Circuit by 2040. But a greater regional investment is needed to meet that goal. 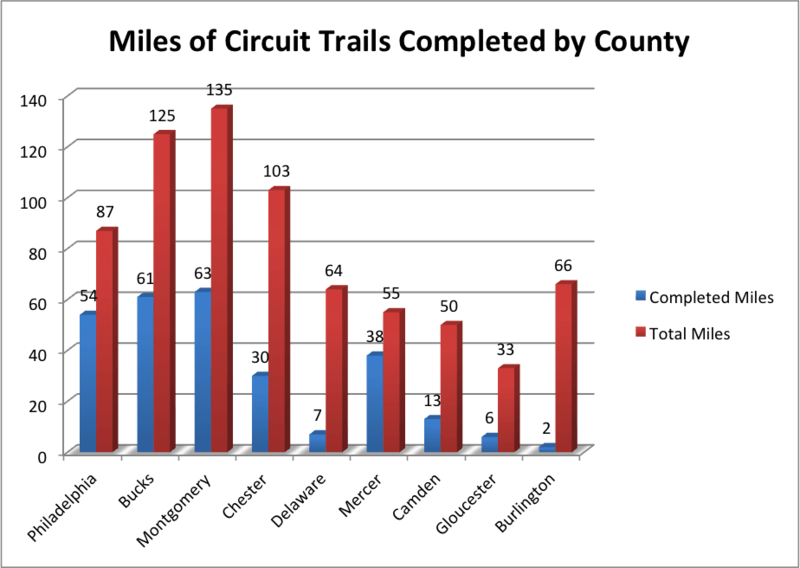 The Circuit is spread throughout our region’s 9 counties, but they vary widely in the progress each has made on building trails.